Beautiful stone cottage combining respect for tradition and use of natural materials (hemp, lime, wood ...). The woodwork, stonework, decoration and comfort make this cottage a warm, charming place for a holiday exotic. Cottage of 90 m² on 3 floors, living room with dining area and lounge, kitchen with wood stove, 1 bedroom and 1 mezzanine with sleeping area and library area. Terrace of 15 m², pleasant private garden of 700 m² with beautiful views of the countryside. 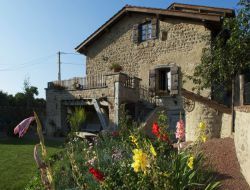 Between Lyon and Clermont Ferrand, in the peace, 2 spacious and comfortable gites being able to welcome up to 22 persons in 7 flexible chambers. The heated swimming pool and the pony in free walk shall decorate your holidays. The site is adapted to the handicaps. 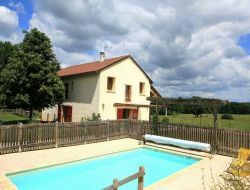 Rent of a gite of big capacity for 12 to 14 persons in the countryside, ideal for the rest. Garden and secure heated pool. 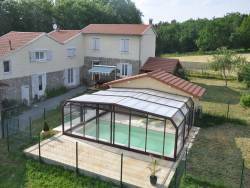 Holiday home with 4 bedrooms and mezzanine, 2 double beds, lounge, big kitchen, 2 bathrooms. 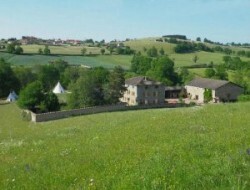 Unusually stay of simplicity and conviviality, in the middle of nature, near the green Beaujolais. 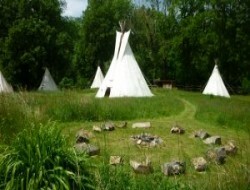 Come to get fresh ideas in our camp of teepees with its area bar, its campfire and barbecue, its playing fields (petanque, ping-pong, badbinton, archery), its big central teepee for the more intimate evenings around the fire(light) and its 5 teepees of sleepings around.